Quaint home at end of cul-de-sac, on 2 acres of privacy, tons of garage space and a truly beautiful setting in the mountains! This bi-level home has large windows, letting in abundant sunlight. Cozy living room with wood burning fireplace, open to dining area and kitchen. Walk out to wrap around deck and enjoy the view. Upper level has master bedroom and private bath, plus two additional bedrooms and full bathroom. Walk out to upper deck from front bedroom. Laundry closet in master bedroom. Attached, deep single-car garage provides abundant storage or work space. Plus, an additional oversized, detached 29 X 27 2-car garage with 10 doors! Also a small shed on property. 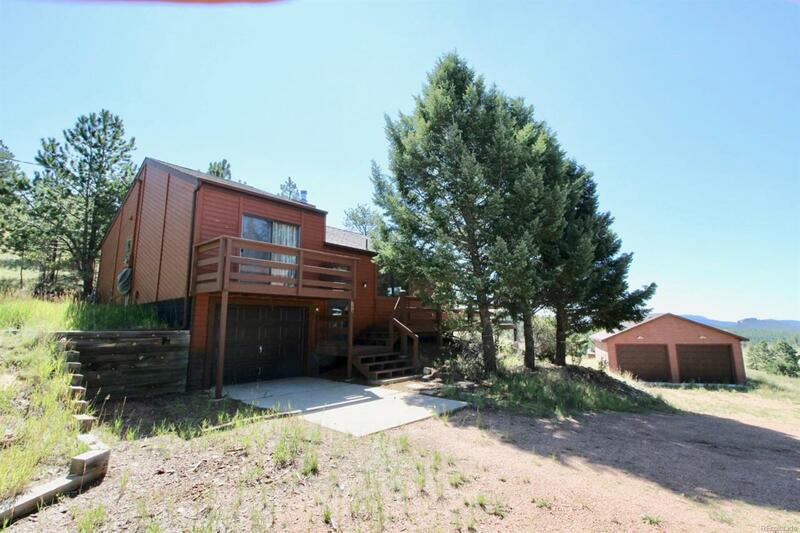 This home would be great for a getaway home or vacation rental! Close to Florissant Fossil Bed National Monument, historic Cripple Creek and surrounding trails, campgrounds, rivers and lakes. Priced to sell quickly!